Born 11 September 1896, in Syracuse (New York); died 22 January 1970, in Fort Lauderdale (Florida). Hildegarde Hamilton began her training in Plainfield, New Jersey, and made her first study trip abroad in 1909, before continuing her studies, notably at the Art Students’ League, New York from 1912–1914. After graduating from the University of Arizona, Tucson in 1921, she spent the years 1921 to 1926 studying abroad, at the Julian, Colarossi and Grande Chaumière Academies in Paris, the École des Beaux-Arts (Fine Art Schools) of Paris and Toulouse, the fine art academy in Seville and the Harvey and Proctor School of Modern Landscape in Newlyn (Cornwall). She wrote and illustrated a book of short stories called Human Bits, published in May 1927, and travelled widely. In 1928–1929 she went to France, and then again to France and Italy, then to Switzerland, Yugoslavia and Greece. In 1930 she went traveling again. In 1931 she met Rudyard Kipling, in 1934 she again travelled to Europe and, in 1937, to the Bahamas. From 1958 to 1963 she travelled round the world. Hamilton was a member of numerous artistic clubs and societies, including the Arts Club of Washington, the Pen and Brush Club, the National Arts Club, which she joined in 1932, the Society of Independent Artists in New York and the Société des Artistes Indépendants in Paris. She painted architectural subjects of historical interest, many landscapes, notably of the French Alps, seascapes and portraits. 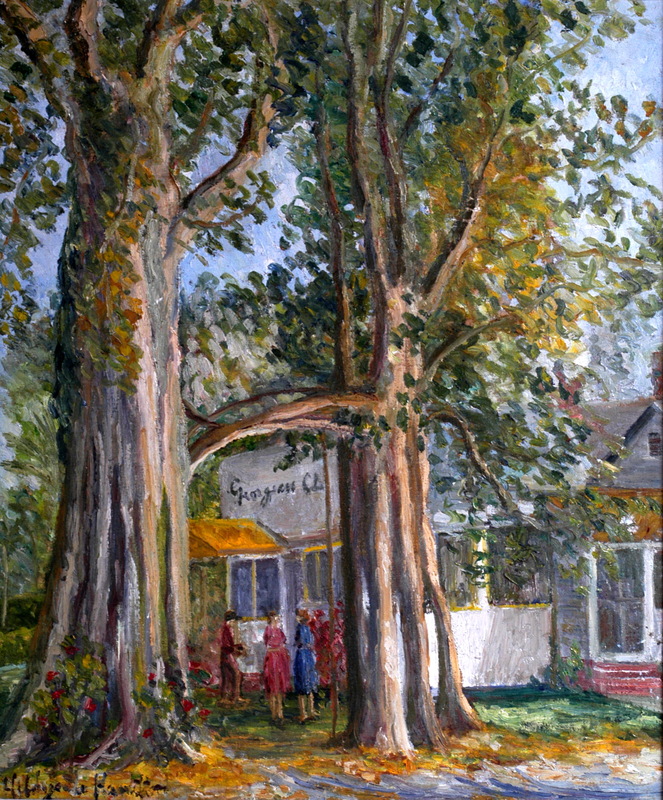 Hamilton showed her work in numerous group exhibitions, including at the Society of Independent Artists in 1929, 1933 and 1944, at the Salon des Artistes Indépendants (Salon of Independent Artists) and at the Salon des Femmes Peintres et Sculpteurs (Salon of Women Painters and Sculptors) in Paris in 1929. Hamilton had her first solo show in 1927 and afterwards exhibited very regularly in Lexington (Virginia), New York and Huntington (Long Island). Other solo exhibitions were held in New York, Grenoble, and at the Bernheim Jeune gallery, Paris in 1928, in Long Island and New York in 1929, in Richmond, Washington and at the Syracuse Museum of Fine Arts (Syracuse) in 1930, in New York in 1931, in Constantinople, Sophia and Heidelberg between 1933 and 1935, at the National Arts Club, New York in 1935, at the University of Kentucky Art Center, Lexington in 1936, in Washington in 1937, in Nassau (Bahamas) in 1949 and at the Pen and Brush Club, New York in 1954 and 1959. Her last recorded exhibition was in New York in 1970.